After a decade as the nation's economic basket case, the news out of Michigan during the past year has been relatively decent. After ten disastrous years, two under decidedly un-conservative Republican John Engler followed by eight under Democrat Jennifer Granholm, almost anything would look good. The state still has a long, long way to go, which makes it absolutely appalling that the big agenda item right now in Lansing is how to raise gas taxes and vehicle registration fees in a "bipartisan," politically survivable way. 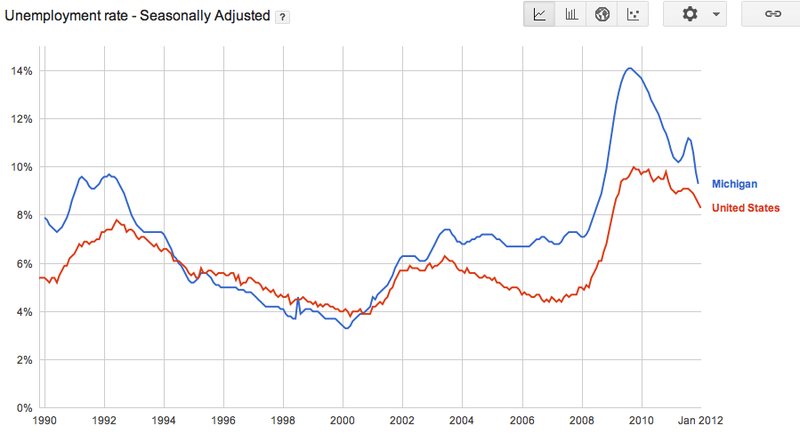 Before Republican Governor Rick Snyder's January 1, 2011 inauguration, the Wolverine State's seasonally adjusted unemployment rate had been two or more points higher than the rest of the nation since 2005, peaking at 14.1% in the summer of 2009 shortly after the recession's official end. 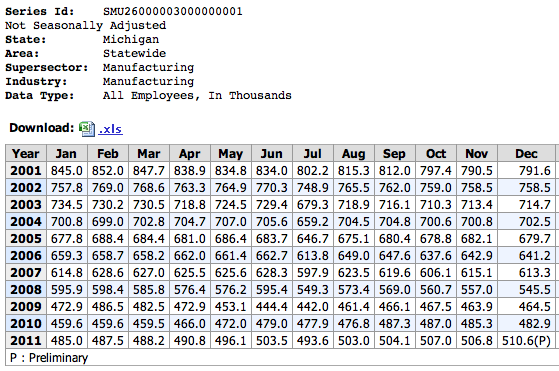 In December 2011, the rate was a still unacceptable 9.3%, but less than a point higher than the rest of the U.S. The easy, breezy leftist explanation for this improvement is that Uncle Sam bailed out General Motors and Chrysler while "saving" the auto industry. The evidence that those decisions represent the source of the state's nascent turnaround is mixed at best. After losing 195,000 jobs during Engler's final two years and 637,000 during Granholm's first seven, the state only picked up 37,000 by the end of 2010, over eighteen months after over $80 billion in bailout money was disbursed. In 2011, after Snyder's arrival, total employment increased by over 66,000 jobs, as private-sector additions of 81,000 offset long overdue but still too modest decreases in the public sector. 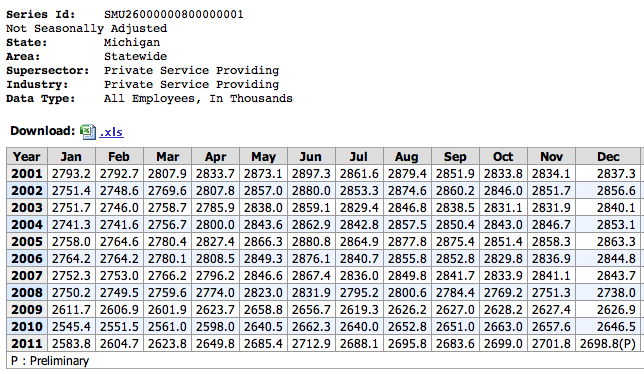 Over 52,000 jobs were added in "Private Service Providing," while all forms of manufacturing accounted for less than 28,000. Additionally, Metro Detroit's unemployment rate was 10.5% in December, while the rate in the somewhat less auto-dependent rest of the state was 8.3%, a bit below the year-end U.S. rate, lower than Midwestern neighbors Indiana (9.0%) and Illinois (9.8%), and barely higher than Ohio's 8.1%. An apparent change in Snyder's attitude (or one he kept concealed from voters in 2010) threatens Michigan's progress. Even though they are still outperforming his state, Rick doesn't like much of what he's seen in Wisconsin, Indiana, and Ohio. He recently told the Associated Press that he wants to avoid "the divisiveness, the hard feelings" seen in nearby states. Apparently, attaining Wisconsin's 7.1% unemployment rate, largely maintained as a result of public-sector and collective-bargaining reforms, isn't worth the effort if it means that opponents might try to recall you, as they are attempting to do to Badger State Governor Scott Walker. Indiana's bold move under the leadership of Governor Mitch Daniels to become a right-to-work state is apparently too dangerous to try in Michigan, even though overall union membership there has fallen by 18% (from 22.1% of those employed to 18.3%) in the past decade, and despite the fact that a recent poll found that voters in more liberal Minnesota (including a plurality of Democrats) favor such legislation by a 55%-24% margin. For "Don't Rock the Boat" Rick, attempting meaningful public-sector employee reform and failing thus far, as John Kasich has done while otherwise improving the fiscal and economic situation in Ohio, doesn't warrant the political risk.